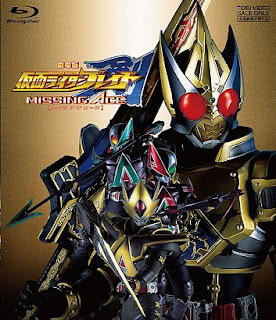 Four years after an alternate ending to the series, in which Blade seals the Joker, the characters have moved on with their lives: Kenzaki is a garbage man, Mutsuki has graduated high school, and Kotarō has published a book about the Kamen Riders to great success, but on Amane's upcoming birthday, it was revealed that she has become a delinquent without the emotional support of Hajime. The Undead have been re-released, and a new trio of Kamen Riders—Glaive, Larc and Lance—have emerged from BOARD, now led by Tachibana. After recapturing two of the Category Aces, Kenzaki and Mutsuki join with the new Riders. When all the Undead are sealed once more, Glaive reveals himself to be the Albino Joker, a white version of the original Joker, and captures Kotarō's niece to obtain the ultimate power, sealing her in the Vanity Card. In order to free Amane from the card, Hajime is unsealed from the Joker Card and the four Riders are again united, intent on saving Amane and stopping the Albino Joker.